In The Hopes of Snakes, Lisa Couturier celebrates the stories of forgotten, overlooked animals who have adapted nobly to city and suburban life in the Northeast. With sharp perception and deep humanity, she has found what is so remarkable in the nature we see most often and illuminated it like no one before her. The Hopes of Snakes is an eloquent and powerful debut by one of the best new writers exploring nature in the humanized landscape. "The essays combine nature writing, philosophy, theology and feminism . . . the writing is lyrical, even when Couturier explores the ecology of New York's subways." "Beautiful, intelligent, and literary . . . this book is a wondrous pleasure, yet it has the ability to shift the way you look at the natural world. 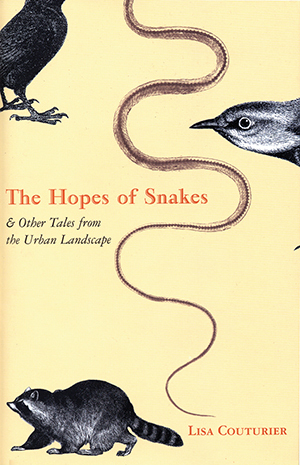 The Hopes of Snakes belongs on the bookshelf next to Edward Abbey's The Serpents of Paradise and Annie Dillard's Pilgrim at Tinker Creek and, like those, is a book to savor, to know, to love and to share."